Spring is in the air with this adorable Flowers slot from Net Entertainment. And adorable is the right word for this Flowers mobile slot game. The design is slightly goofy and simple, and the bonus features are hardly what we’ve come to expect from other more sophisticated NetEnt video slots, but it works well on mobile. This is the kind of fun game you would want to play when it’s cold and grey outside and you need a little sunshine to cheer you up. Though the sounds are fairly generic, with 30 paylines, stacked wilds and free spins, this mobile video slot has plenty to offer even the biggest pessimist. The big draw here is the fact that in the Flowers Touch slot you get single and double flower symbols over the five reels. So the maximum win isn’t 5 symbols, but 10. Double symbols count double, obviously. So if you get a single blue bell on reel 1 and 2, but reel 3 has a double blue bell, you’ve actually just got 4 of a kind win. That also mean that getting three of a kind is fairly common, but, as you can imagine, fairly low paying. The slots free spins bonus feature is where this game blooms, with a maximum of 30 free spins and a 10x multiplier up for grabs. It is, in fact, the biggest draw this Flowers mobile video slot has going for it – without it it would be a fairly below average NetEnt game. Despite the double symbols on the reels, realistically it’s here that any big wins are hiding as the wilds come stacked, so getting several wins on these 30 paylines becomes a reality. But you’ll have to carefully budget in order to wait for them to come. We’ve yet to hit that BIG free spins feature with the 10x multiplier, but we didn’t really expect to. It’s like hitting a jackpot – we all play for it, but most of us will be happy with 15 free spins with a 2x multiplier. However when you do get free spins, the stacked wilds almost guarantees plenty of coins for your garden. Wild Symbol: Nothing like some sun to put a spring in your step. And with this little sunshine, you’ll be practically skipping down the road holding your smartphone in tow. Not only does it substitute all symbols (except free spins and double symbols) but during free spins they become stacked wild symbols which can appear on any reel, increasing your chance of winning. Free Spins: You’ll be chasing those smiling clouds throughout your game, waiting for those free spins to appear. Technically there are two free spin symbols, one with one cloud symbol and one with a double cloud symbol. The more clouds you get, the more free spins and multipliers you’ll receive. 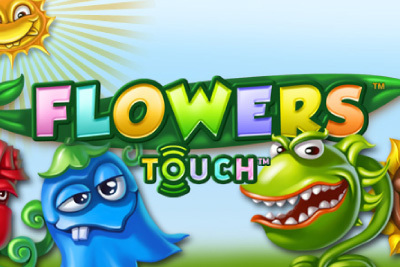 Flowers mobile slot is a cute and goofy NetEnt Touch slot that keeps you on the edge hoping for more free spins. It's not as dangerous as some of the other high variance video slots out there, but stills needs a little budgeting if you hope to hit a decent free spins. That said, the fairly generous return to player rate 96.4% should help you keep spinning. If Flowers sounds too dangerous, then we'd recommend The Fruit Shop slot or even the wonderfully sticky Stickers Touch. They have the same happy summer theme, but a little more easy going.